“Probably there is no real Paris, except if you have always lived there. For those of us who arrive only to go away, the place teems with ghosts.” – Clive James, A Postcard from Paris, 1980. This trip to Paris was the first time I visited the French capital. It seems amazing that it took so long to get there. After all, it was always the cheapest flight from England, or a simple train ride from Berlin. We passed through it on our way to Versailles on a French exchange trip but I remember only the traffic beneath my window, the rain on the streets, and the fact that we were not allowed out of the bus. So that doesn’t count. I always thought that I did not make it to Paris because it was so close. It wasn’t going anywhere and it was always going to be easy to get to so why not try something else? But now I think there was something else at work, namely those ghosts that Clive James was talking about in his article written over thirty years ago, who lived in the pages of some of my favourite books and that had painted a picture of the city that I was convinced the real thing could never live up to. Of the places represented on my bookshelves only New York can probably compete with Paris, and I have never made it there either, and it was this realisation that has made me sure that it was the fear of disillusionment and disappointment that kept me away from these cities for such a long time. 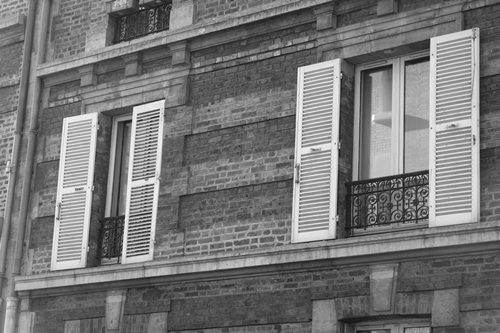 It was clear that the Paris I would experience would have little, if anything, to do with the Paris of James Baldwin and Ernest Hemingway, of Allen Ginsberg and Jean-Paul Sartre. To expect to find their ghosts skulking on Left Bank streets would be an expectation impossible to fulfil. So as we travelled, via Saarbrücken across the frosted landscape I told myself not to expect the Paris of my imagination but to judge the place on its own merits, as it is now. 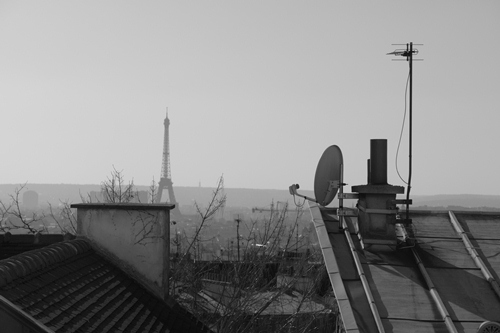 First impressions seemed designed by some twee-vil cooperation between the French Film Marketing Board and the Parisian Tourism Office. We had booked an apartment on Montmartre, a stone’s throw from where Picasso had his studio, on one of those narrow cobbled streets at the top of a staircase, a short walk from the ornate entranceway to the Metro station and past at least one café that would do for a 1920s period piece, a bookshop with a window display of serious-looking books, and a bakery complete with ornate signage and a wicker basket behind the counter filled with irregular baguettes straight out of my school French textbook. The apartment itself was through a courtyard and up a narrow staircase. We met a lady on the way up who was all charm and smiles, and we felt welcome even though we could not understand a word she was saying. From the window we could see the Eiffel Tower and in the morning the neighbours practised cello before holding a passionate-sounding argument in the stairwell. Yes, any location scout would have rejected the place on grounds of cliché alone, but there you go. It was all very interesting, and nice, and we found our little spots that are important in making a place feel at home however short your stay, and for the whole time I barely wrote a word in my notebook. Why would I? If I look over my shoulder now from where I am typing this I can see those books, all those hundreds of words, set in Paris across different decades and in different forms and I know that I scribbled little – far less than I did for Saarbrücken – because when it comes to Paris you just get the feeling: what is there left to write? At Paris Est Station, waiting for the night train in an under-heated fast-food joint I made the first notes that became what you are reading here. Paris was never going to be a place to inspire me creatively. It’s already been done, and oh so many times. But it did get me thinking about our relationship to places that we have experienced only through the written word, or the photography of others, or a film on the screen. If I sensed an atmosphere in Paris, however much I tried to judge it purely on its own merits, it was always going to be flavoured by what was already there in my imagination. So that little square at the end of our street, where a couple of Spanish tourists posed for pictures by a door through which Picasso almost definitely once walked, means something different because you have that knowledge of the past, and of the ghosts of those who once climbed those steps. The place teems with those ghosts – old Clive got that right – but it is important to remember that those ghosts will depend on each individual, and the collision between the imagination and the reality of the city will be entirely personal. I tried to go to Paris with low expectations. It is a measure of the place, of the city as it is as much as what was already there in my head, that I am already plotting a return. This entry was posted in Places, Reflections on February 7, 2012 by Paul Scraton. Paris was never really top of my visit lists, maybe also because of how people talk of it, the so many photographs of it, and the history of it. 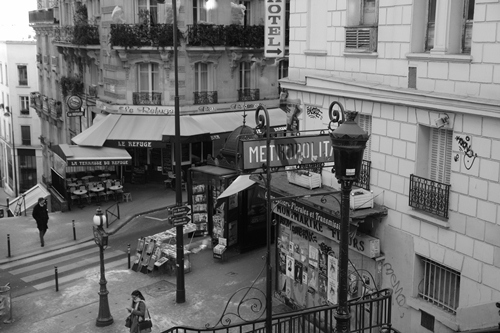 I’m glad I went though (with Jo), also staying in Montmartre. I preferred the tiny alleyways and step steps there, to the open boulevards and central city streets. We actually saw quite a lot of the city, visited markets, raised walk-ways and had the usual river-cruise. I don’t think, to me, it was like how I’d heard. It was another beautiful, vibrant and interesting city, and one I’d go back to. Hi Rich, thanks for the comment. “Beautiful, vibrant and interesting” just about covers it! I so enjoyed your piece about Paris, Paul. Thank you. I feel the tug of these decade-spanning memories even just thinking about the city, and there are personal ghosts in there as well as the ones I have wanted to touch, the famous ones. When I was nine (in 1948) I was given a brass braclet from Nellie Jones. It had enamelled images on square linked sections. These are (because I still have it) of the important buildings of Paris. I learned their names with care. When I was in secondary school, I had a french teacher who loved Paris with infectious enthusiasm. He talked about these buildings. Davy Thoms. George will have been taught by him too. These were magic lessons. I take Davy Thoms to Paris with me every time I go. I’ve visited the buildings, I’ve loved the city. But on top of that, I’ve seen the paintings! That (rather than writing) was the adult call of Paris to me. With friends in Paris, for a day in 1964, on our way to Spain, I went to see the impressionists work, I rushed through the Louvre through centuries after centuries of art only to learn that the impressionist period was housed in the Jeu de Paum. We ran there and caught it before it closed. Starry, starry night hit with such impact! Then all the others….. No words…. Later, back with George, standing at the top of Notre Dame then watching the filming of the ‘Nuits des Generals’ on Place de la Concorde with Mum and George. Later with my kids, up the Eiffel Tower and in to the Gare d’Orsay – on the steps of Sacre Coeur – eating a baguette in a park. Later on my bike with Don, stuck in the metro from De Gaulle, trying to surface at Gare du Nord, heaving the bikes over the turnstiles. Cycling among the traffic getting directions out of the window of a passing car. Eating and drinking in cafes. Missing the train and finding a lovely little hotel. Going to free concerts all around the centre. 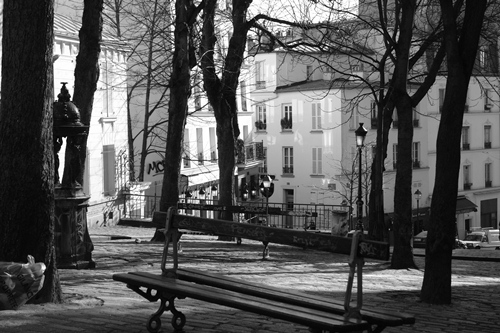 Going to a friend’s retirement party in Montmartre and staying in a flat there. I recognise the place in Katrin’s photograph. What a place, at that time, for Henry Miller to find. Today you find, in Paris, what you seek. There is history. There is pomp. There is grandeur. There is beauty.There is art. There is music. Travel out of the centre and there is something else. But we stay in the centre. We keep ourselves insulated. It’s kept clean, the police have guns, the metro is carefully watched. Graffiti is removed. People commute into the centre each day to work. Properties in the centre are for the very wealthy. We see something sanitised and unreal in a way, for the tourists. I know all this but Paris is my mum’s friend, Davy Thoms, Van Gogh and Cezanne, George and my Mum, Me and Don cycling, my kids and their enthusiasm for all that they saw and felt. Paris is still truly a place of magic for me. Thanks so much for such a wonderful contribution to this discussion of Paris, and I think your comment illustrates what I was trying to say, namely that if these places are populated by ghosts then they are always personal to us, and will be different for each person.